Did I ever tell you that I have a "thing" for dishes? Well I do. I have way more sets of dishes than is reasonable. 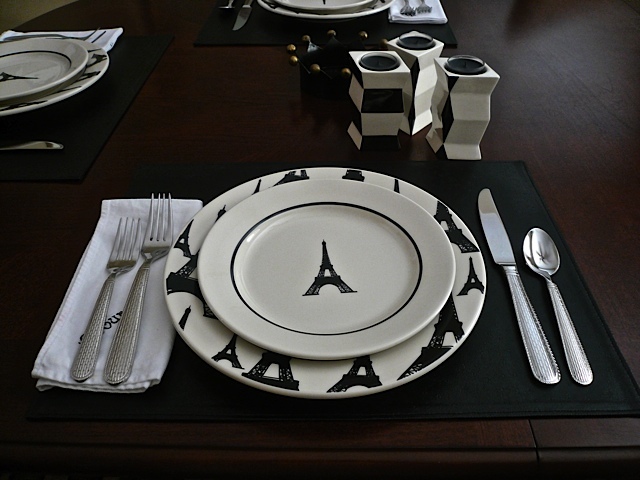 The set I have pictured here is not new but, I got them out recently when I fixed a French themed dinner for some friends. Using these dishes made the Beef Bourguignonne taste even better and brought back memories of Paris at the same time. 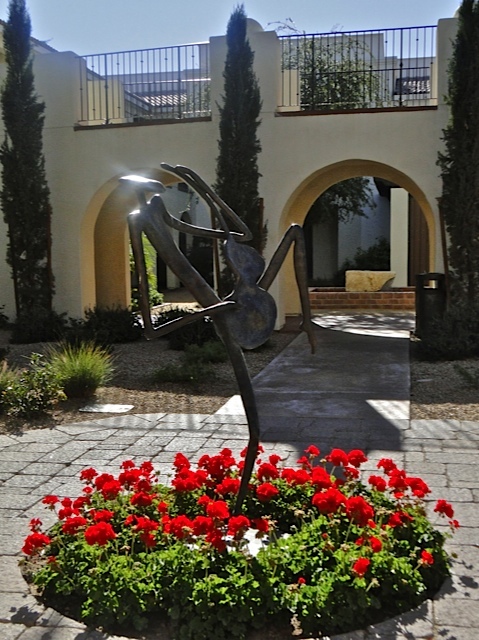 I found this amusing sculpture of a skinny guitar player in a courtyard at the Monte Lucia Resort. 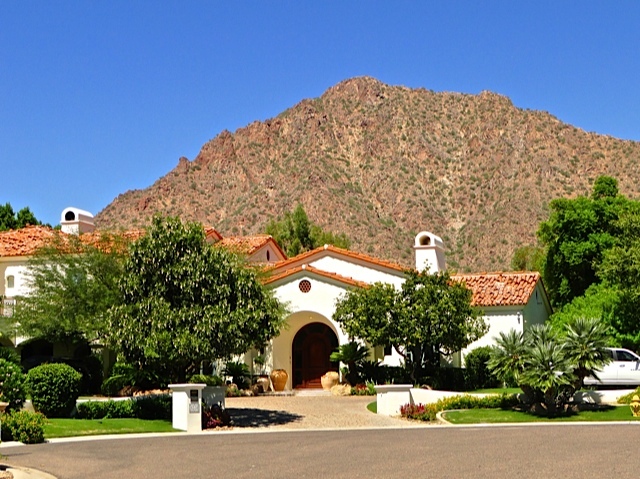 This home in east Phoenix is situated with a dramatic backdrop of Camelback Mountain. I apologize for the fuzzy iPhone photo but, I wanted to show you the inside of Symphony Hall from Saturday night. 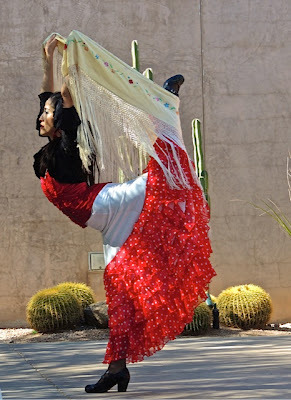 I went with friends Julie and Dave (Scottsdale Daily Photo and Tamarindo Costa Rica Daily photo) and Julie's mother Glenda and my close friend David to see a performance of "Carmina Burana". 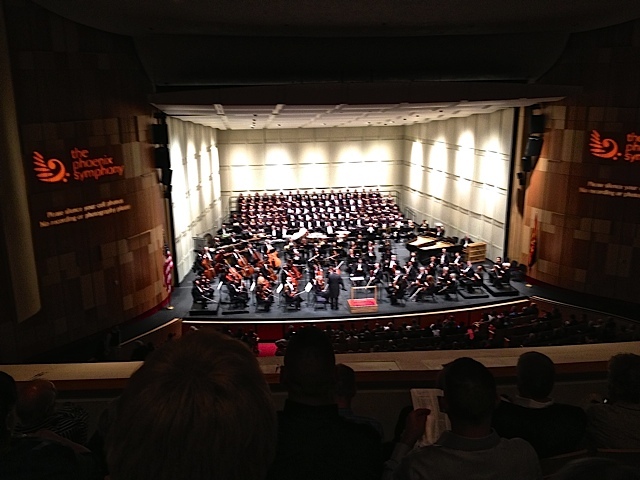 It was exceptionally well done with that full chorus you see seated in the back of the stage. I enjoyed that powerful music very much. 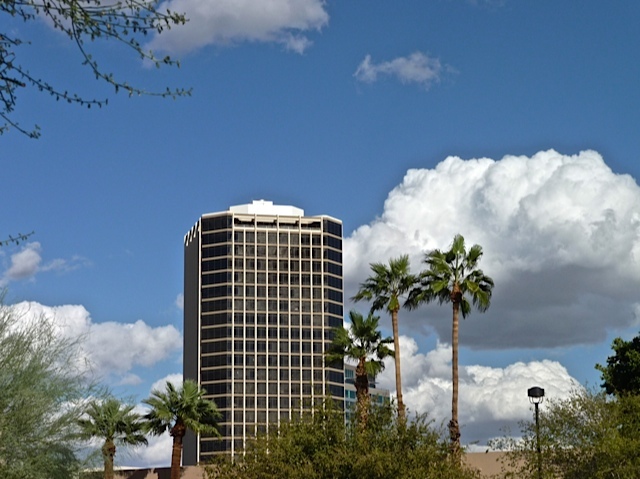 The evening was so much fun that the group went to see the comedy group called "Capitol Steps" the next day at the Scottsdale Center for the Arts. So it was a busy but thoroughly enjoyable weekend! Since I posted my Renaissance Man yesterday I thought I'd remind you of what the Renaissance Square Buildings look like. 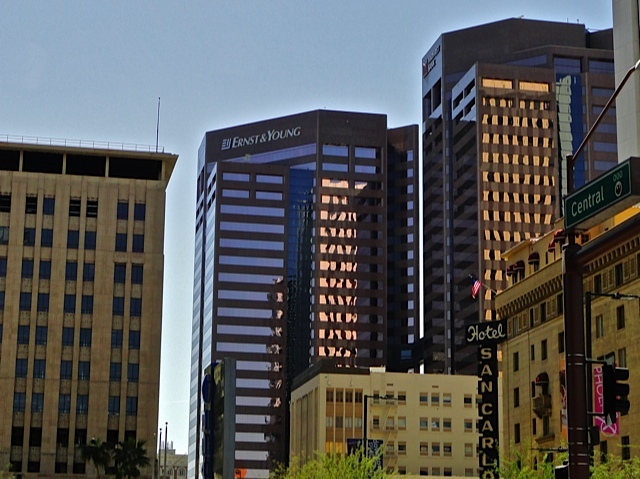 It's those two tall towers one of which has Ernst & Young on the top. They are joined by a skywalk that you can just barely see above the roof of that low tan building below. 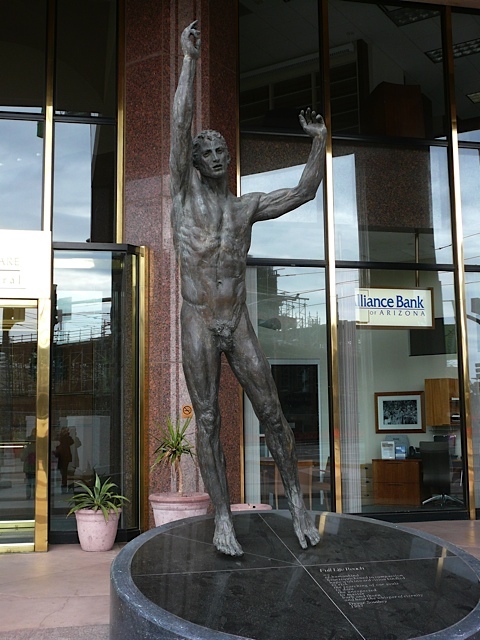 Renaissance Square was designed by the architecture firm Emery Roth & Sons, a firm who designed many iconic New York apartment buildings. 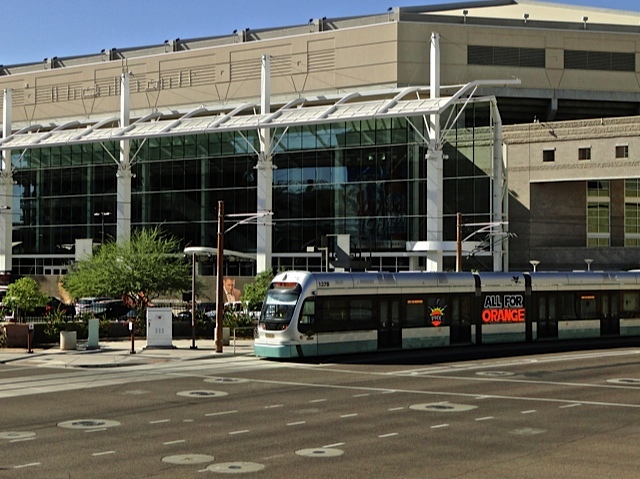 I happened to catch this shot of the light rail decked out in an ad for the Phoenix Suns as it was passing the U.S. Airways Arena where the Sun's play basketball. It seemed like perfect timing. 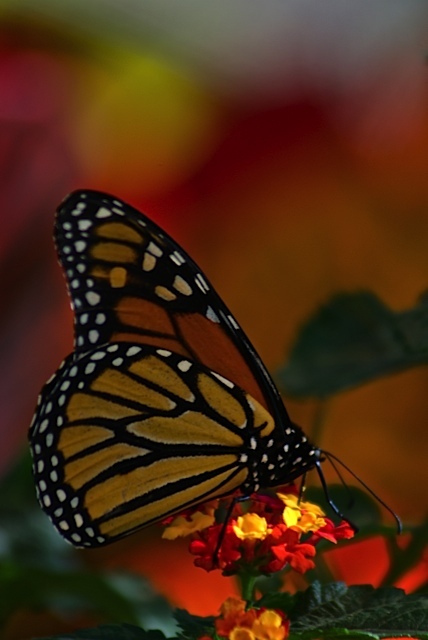 I thought a nice soothing butterfly photo might be the best photo for today as we all recover from way too much food and celebrating. I was lucky enough to experience food and fun at two different houses yesterday and in the process I consumed a lot of excellent food. I think I'll give my stomach a rest today. Happy Thanksgiving to all my American readers. 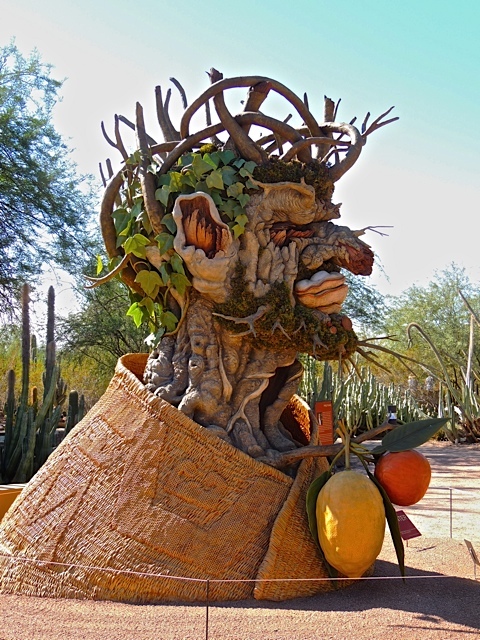 I thought I'd use this picture of the sculpture of "Fall" from the Four Seasons collection on view at the Desert Botanical Garden by artist Phillip Haas. After all, he is made up of all the foods you will be seeing on the table on this day of thanks. 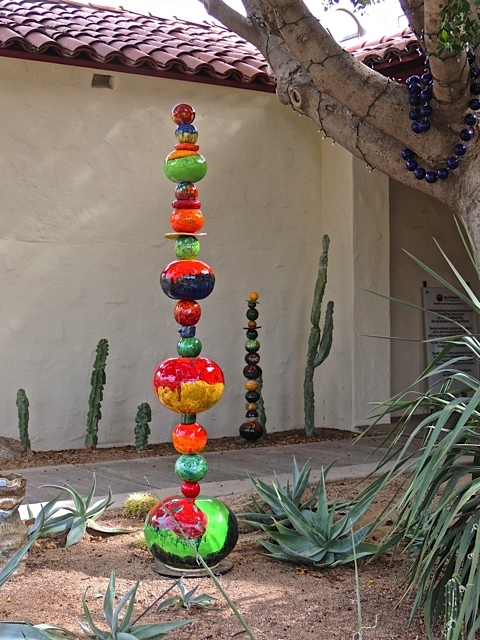 My favorite pieces of art that I saw at the Shemer Art Center were these colorful ceramic totems. The artists name is Janet Orr and she was at the gallery on Saturday and had a beautiful collection of these garden totems for sale. You can see more of her wonderful ceramics by clicking HERE. 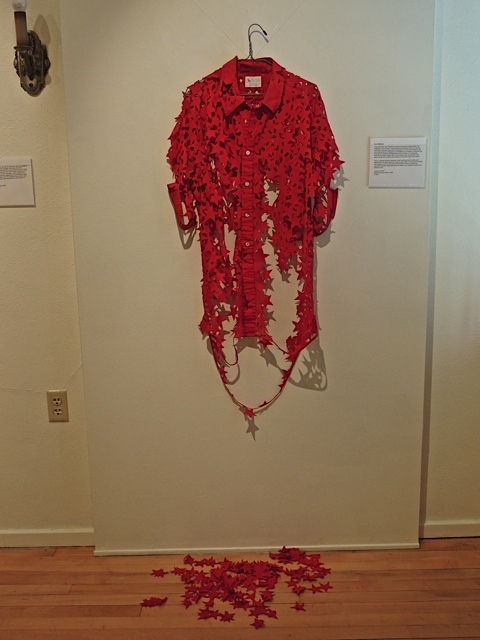 While I was at the Shemer Art Center, I browsed the current show about Fiber Art. 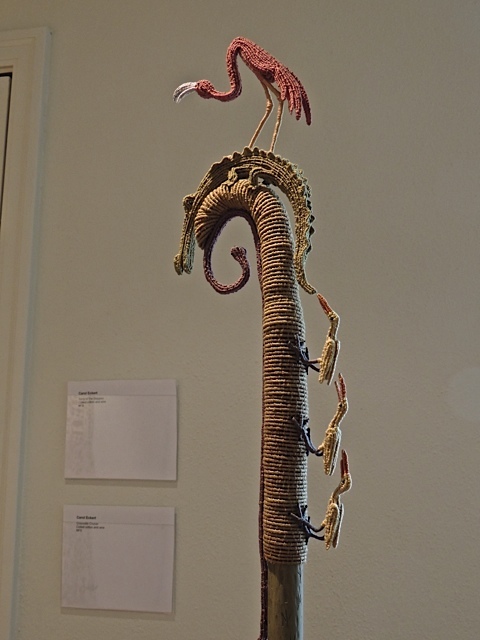 I especially liked this piece called Crocodile Crozier by Carol Eckert. I found this piece very intriguing. The artist statement explains that it was part of a project called The Collective Cover Project where items of clothing that were found along roadways and other places were catalogued, numbered, and photographed along with details of current events on the day the items were found. She states that this shirt appears to be a entry level workers food workers uniform and it was found early in 2009 when the nation was headed into an economic crisis. The artist, Ann Morton states that finding it at that period of time makes a poignant statement about what was happening in the nation. She has cut star shapes from the fabric and left some connected to the garments framework and other individual stars are on the floor below it. Here are two more of the microdwellings that I featured yesterday. 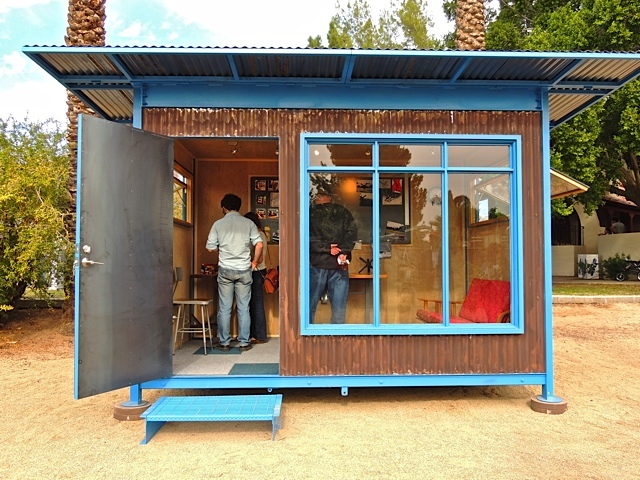 Both of these were created as artist studios. In the top photo you see a TV crew interviewing the builder of this one. The bottom one was quite small but could still be a nice quite place to write, draw, paint, or even blog! 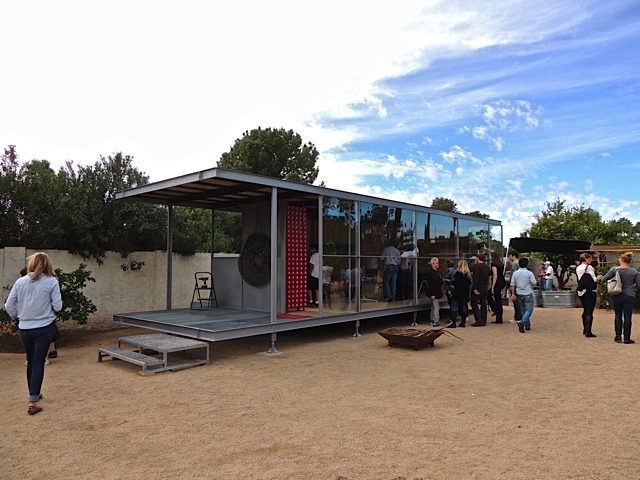 I went to an event yesterday at the Shemer Art Gallery called "MicroDwellings and MicroBrews". 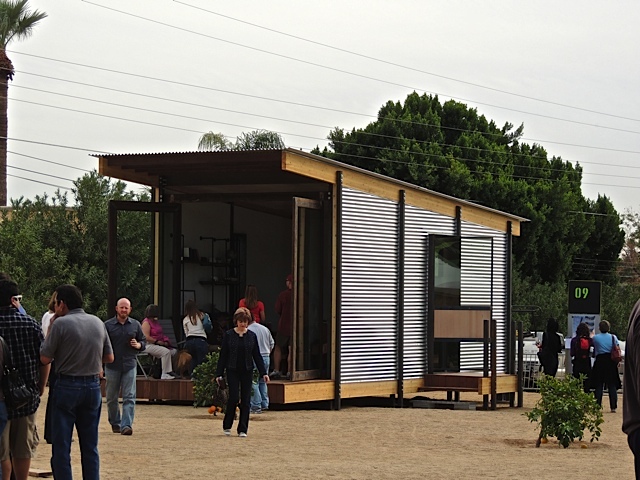 The event featured several living and studio spaces that were small, affordable, and completely portable. 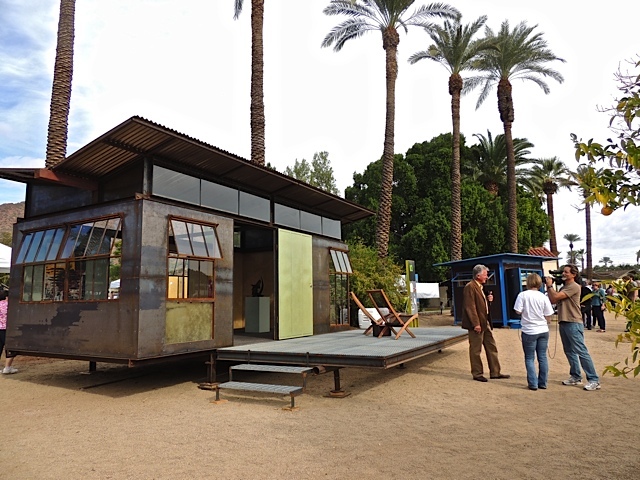 All of them were made from mostly recycled materials. The one above was the largest of those shown and had a whole side made of glass which gave it the feeling of much more space than it really had. The one below had glass on one end so that it could open up to it's surroundings on just the one end. I kept thinking they might be small but, I know people who live in spaces this small in New York City and they pay a whole lot more than these cost and most of those people have to climb a lot of stairs to get to them. The microbrews part of this event was fulfilled with a beer garden featuring the beers of several local microbreweries. Not being much of a beer drinker, I only tried one. I took this photo a few weeks ago on a day when a storm rolled through the valley. The sun setting in the west was below the dark clouds that were hovering above. It made for an interesting contrast. Last Friday I went to a wine tasting at a private residence and enjoyed some delicious wine, great food, and even better conversation. 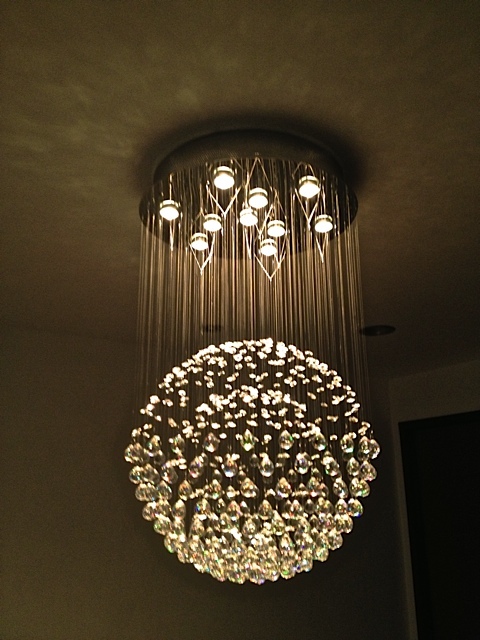 But, I think what impressed me the most was this stunning modern chandelier that was hanging over the dining room table. It was gorgeous but being a very practical person, all I could think of was how difficult it would be to keep that clean. I'm certain I wouldn't have the patience to keep the desert dust off of all those crystals while keeping those threads all straight and even. 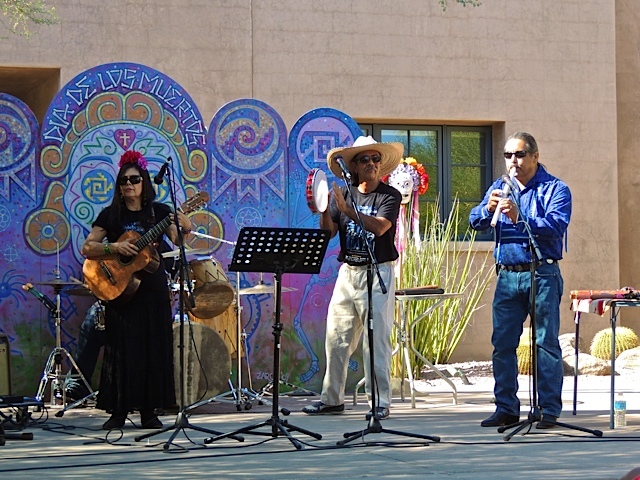 Last Saturday my friend David and I went to the Roosevelt Square historic district street fair and sampled the wares of some of central Phoenix's best restaurants. 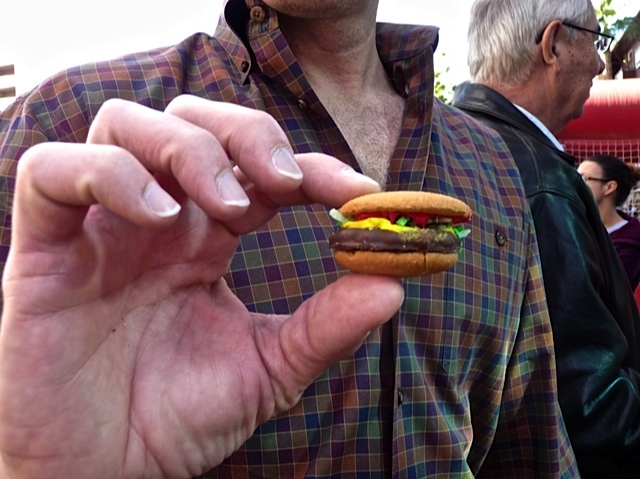 One place that specializes in burgers was serving up these teeny-tiny little burgers. Cute isn't it? I bet you can't guess what it is made of. Two vanilla wafers, one thin mint cookie, red, yellow, green and white icing. David said it was pretty tasty. A clever creation, wouldn't you say? 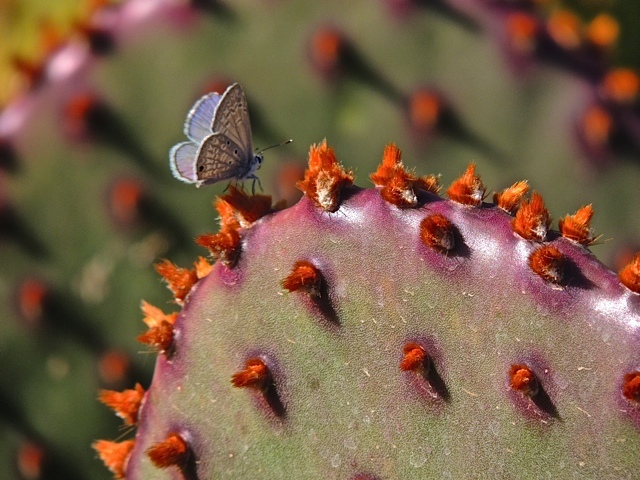 I saw this tiny little butterfly flying around a prickly pear cactus when I was at the Desert Botanical Garden on Sunday. When it landed I wondered if it would be there long enough for me to capture it. It was and here is the result. It was no bigger than the end of my thumb and it made me think of that Elton John song "Tiny Dancer". 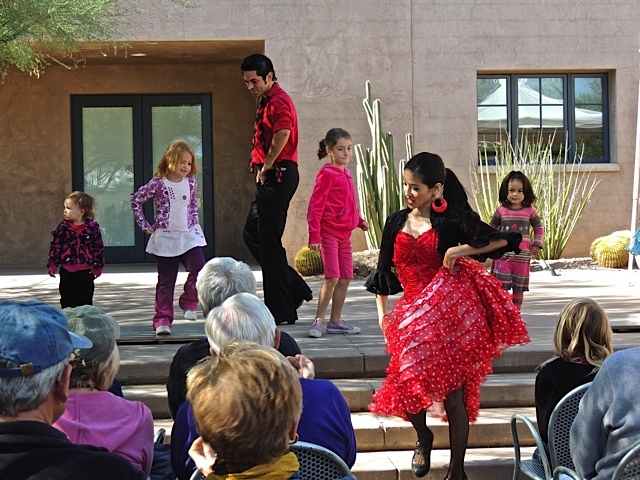 After the beautiful Flamenco dancer finished her dance, she invited some youngsters up the the stage to learn the Flamenco moves. Some to of the participants were learning at a very young age. They were so much fun to watch. 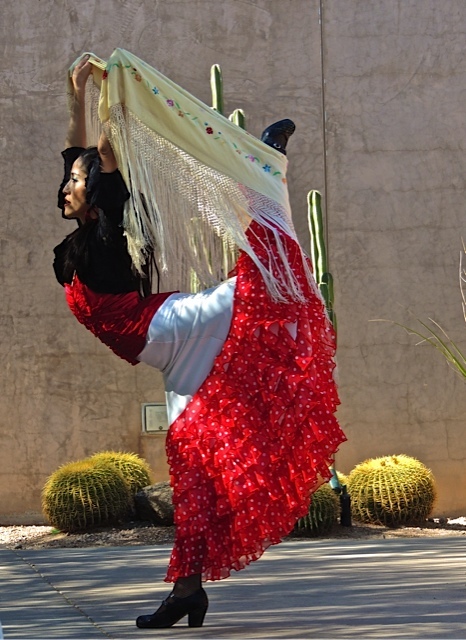 I went to the "Chilies and Chocolate" festival at the Desert Botanical Garden on Sunday and enjoyed this Flamenco dancer entertaining the crowds. She was very talented. Tomorrow I'll show you what happened after this number was completed. It was windy and chilly on Saturday with big puffy clouds filling the sky. I love it when we get these kind of clouds. I call them Magritte clouds. 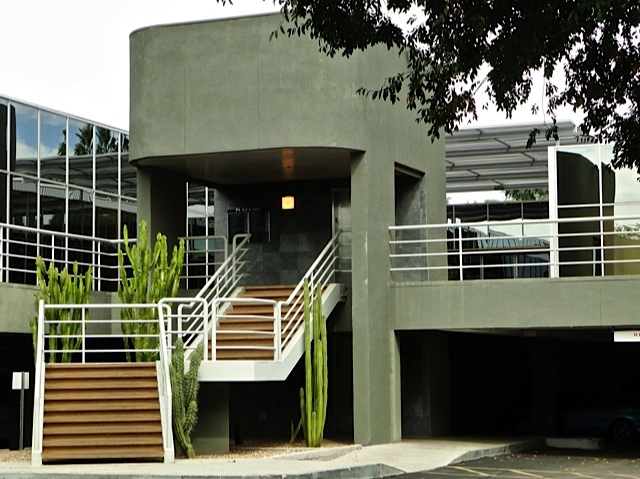 From the street, this building looks very plain. Just gray and glass. But, after driving around the back I see it has a little more style. Modern style. 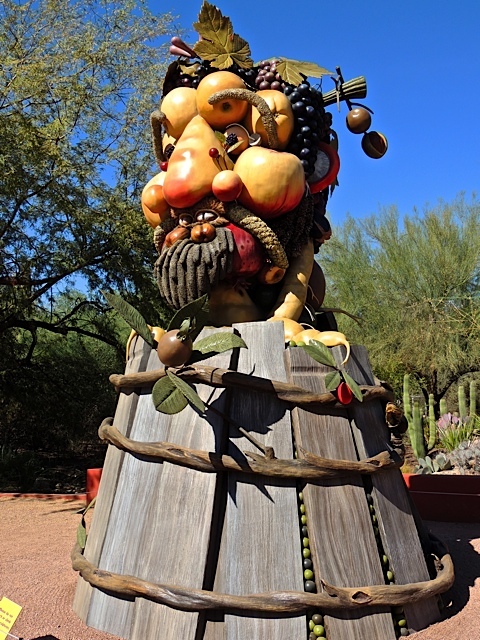 Here are the last two sculptures in "The Four Seasons" exhibit at the Desert Botanical Garden. 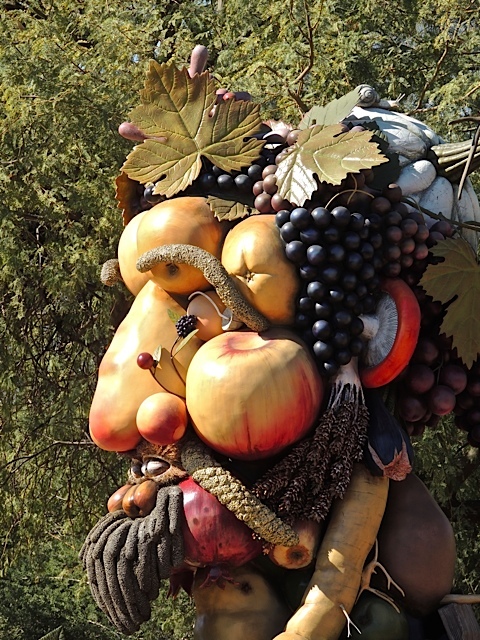 The artist Philip Haas has composed Summer of all the bounty the season produces. I see fruits, vegetables, berries, and grains. Fall is composed of the fruits and nuts that are part of the fall harvest. I should have had a little Vivaldi playing for you while you viewed these huge sculptures. As opposed to Winter that I featured Tuesday, Spring has that youthful bloom in his cheek. 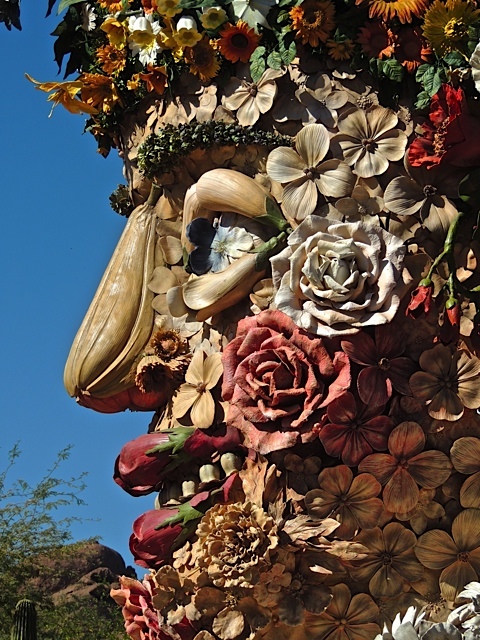 This sculpture is full of flowers and leaves and young growth. A sure sign of spring. 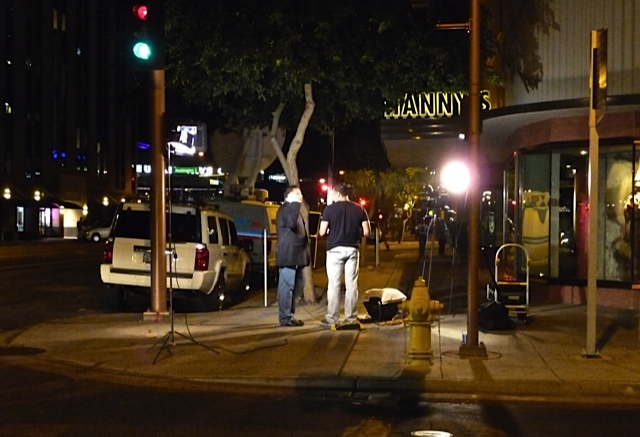 I have to interrupt my Desert Botanical Garden Art posts to show you the news frenzy in downtown Phoenix. 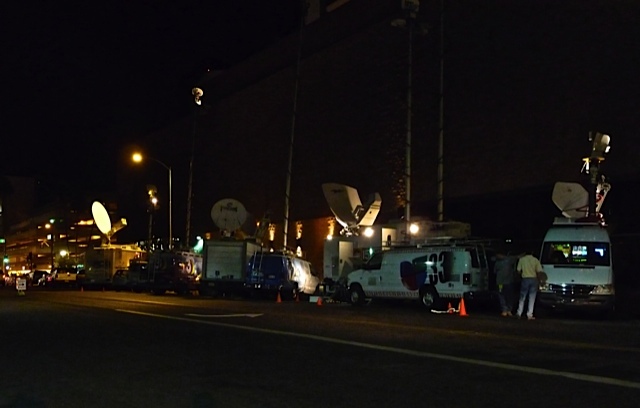 I parked my car and headed to the election night event I was invited to and as I walked down the street I passed all these news vans and cars and trucks parked and ready. And, I've only caught half of them, the other side of the street was full of vehicles also. When I got to the corner I saw a news crew set up on the corner to do interviews. When I left my event, they were still there. We'll pick up on the art exhibit tomorrow, stay tuned. 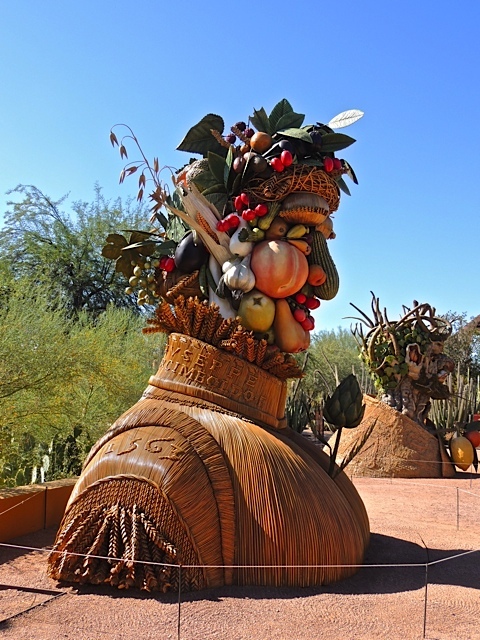 There is a new art exhibit at the Desert Botanical Garden called "The Four Seasons" by artist and filmmaker, Philip Haas. 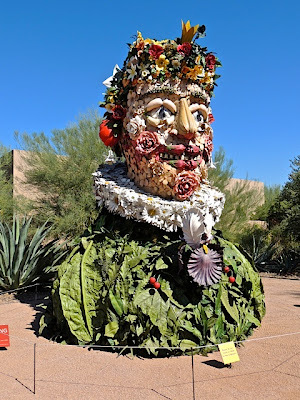 The artist was inspired by Italian Renaissance artist Giuseppe Arcimboldo who painted portraits composed of fruits, vegetables, flowers, and other related materials. 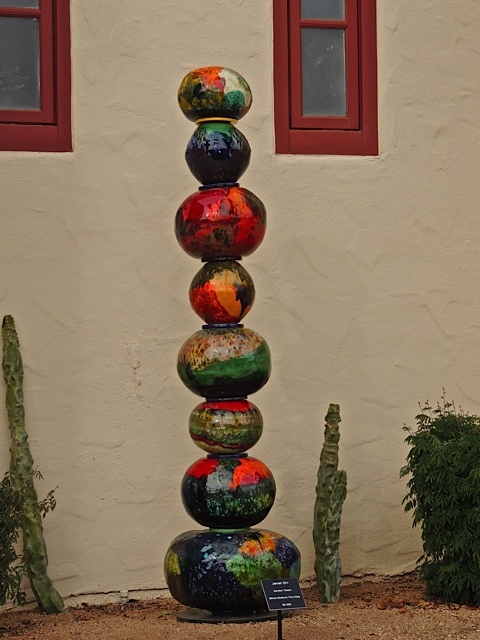 Each of the sculptures is over 15 feet high. This one is titled Winter and he does look a bit worn out. Tomorrow I'll show you another one of these giant sculptures. 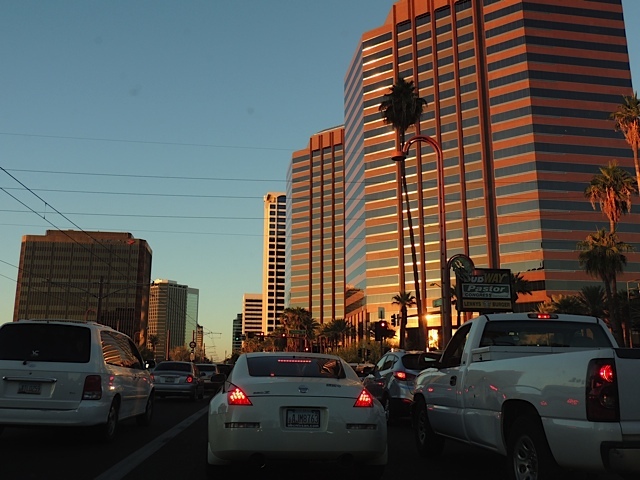 Rush hour traffic on Central Avenue can be very busy but, I do love seeing the sunset glow on the buildings. 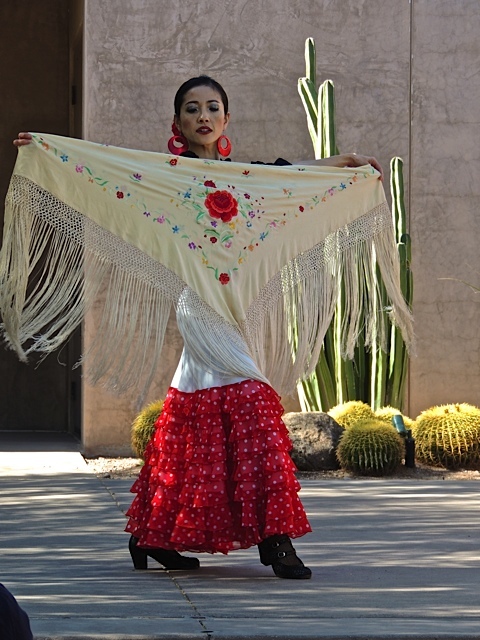 The Dia de los Muertos celebration continues this weekend at the Desert Botanical Garden. I enjoyed some great performances by Zarco Guerrero and his wife and fellow artists. 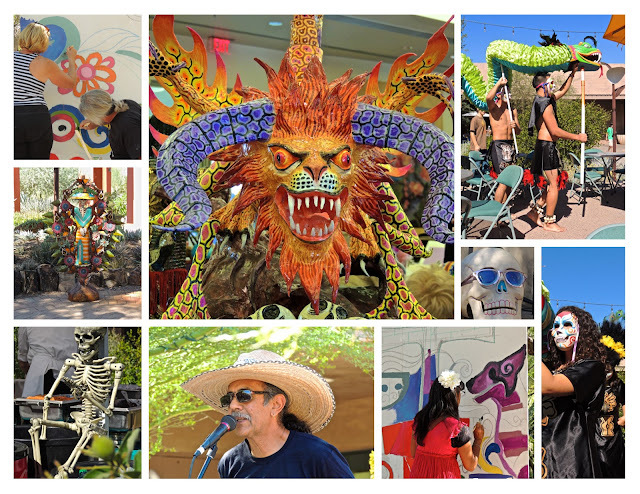 There was a lot going on all around the garden from mural painting, to face painting, to food stalls. In the picture above I show some items that were for sale, Aztec dancers, Zarco Guerrero at the microphone, people taking turns working on the mural, and a friendly skeleton. Lots to do and see. 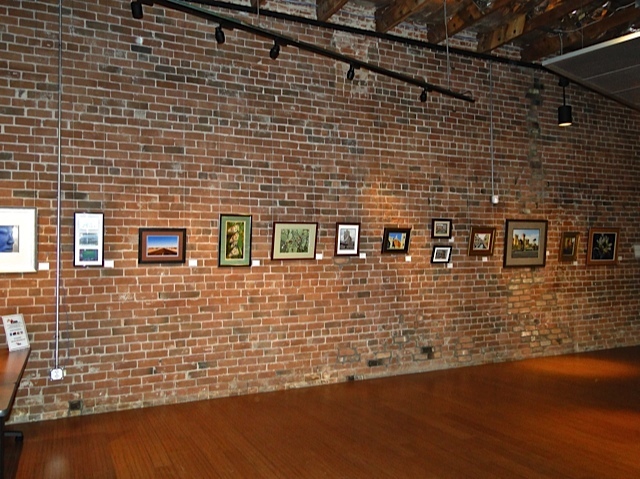 Our new offices had an open house party last night to celebrate our new location and we have this fabulous long brick wall inside the building so, I was asked to display some of my photography for our guests. It was fun, I got to show off some of my work and entertain friends at the same time. Since our new building is located in the heart of the "first Friday" gallery area, we may be doing more of this in the future. 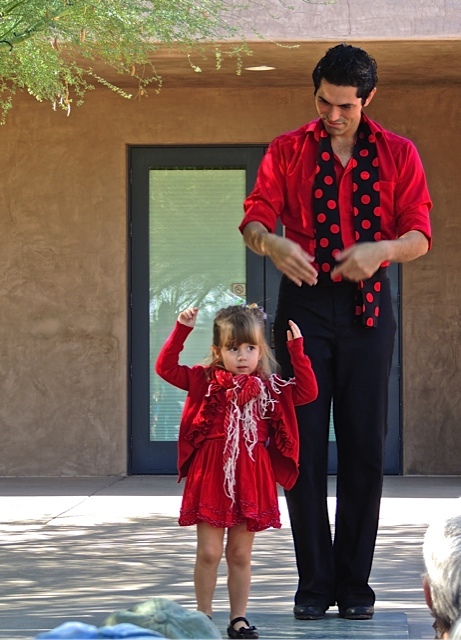 Last night I attended a Dia de los Muertos event at the Desert Botanical Garden. It was called Cuisine and Culture and it was a combination of the history of the celebration and some authentic traditional dishes that are cooked during this time. It was an extremely delicious and entertaining evening. 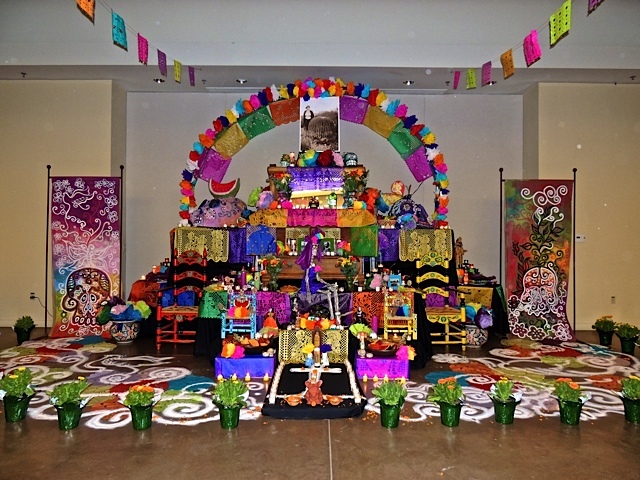 First we learned about the traditional offerings or altars that families create. The one above is a good example. Everything in it is symbolic, the clay dog in the front guides the spirit along that path behind it. On the path are salt and water for nourishment and it's lined with candles to light the way. At the top is a mirror (it's very hard to see in this photo) that serves as a window to the afterlife. Artist Zarco Guerrero assumed some interesting characters to help tell us about the 3000 year old history of this holiday. 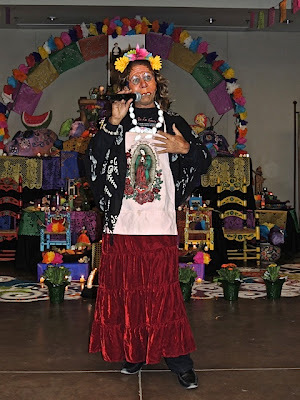 Silvana Salcido Esparza, the renowned chef of Barrio Cafe and Barrio Queen created her special mole along with a few other traditional and delightful dishes. 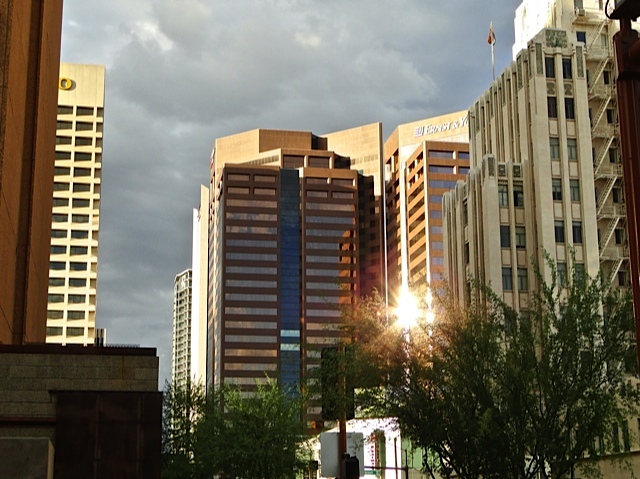 If you are ever in Phoenix, I highly recommend a trip to one of these two restaurants. You won't be sorry. Since Arizona is sort of land-locked, and we don't really have that many "waters edge" places to visit, I decided to head to one of my favorite parks in Phoenix, Arizona Falls. If you don't remember this place, you can see my original post from a couple of years ago here. 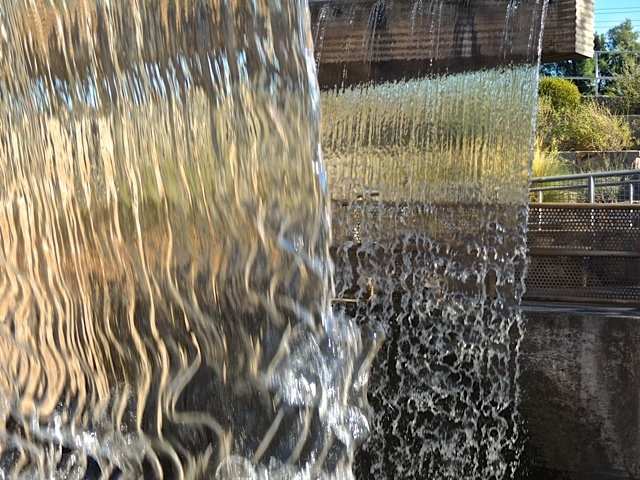 It's a park where one of our major canals adjusts it's elevation at a power station full of waterfalls that help to generate electricity that ends up going into the grid of electricity used by the city. I took this photo to show the "edges" of the two large waterfalls that face each other. So, it truly is the 'edge of water'.